Many business owners and online marketers have no doubt heard the phrase SEO is Dead. For those business owners who haven’t heard this phrase or may be even a little unclear as to what SEO actually is, you’ll want to pay particular attention to this article. The growth and prosperity of your business may depend on it. This is one of those questions that if answered fully, can’t be answered in a couple of sentences but we’ll try to sum it up as best we can. SEO stands for (S)earch (E)ngine (O)ptimization. The goal of a search engine optimization is to optimize your website structure, content, keywords, back links and overall website presence in order to rank well for targeted keywords in search engines results pages (SERPs). High rankings will in turn generate targeted traffic to your website and to your other internet properties. Optimization techniques can be broken up into 2 very broad categories, On-site and Off-site optimization but the bulk of the work is done off-site. Google is the largest and most lucrative search engine when it comes to targeted traffic and as a result most SEO campaigns target Google’s SERPs specifically. Now I realize that many Search Engine Optimizers may not be entirely happy with my definition and I’m inclined to agree. There’s so much more to SEO and it can’t be simply stated as I have done so above but that’s OK, it’ll work for our purposes here. Why Is or Was SEO Important? What it comes down to is that Search Engines will send you the most valuable traffic you can get to your website. Organic targeted traffic is the holy grail of traffic, far beyond what can be achieved through other means. I can already hear the thrones of marketers calling foul. “What about social media?” they’ll say. Social media traffic is also very important but more so in the sense that it allows companies to develop long-term relationships with their customers. The key is to understand the difference in the state of mind between search engine users vs. social media users. Search engine traffic is different because the intent of most users is to specifically find products, services and information. The intent of social media users on the other hand is to socialize. When it comes to traffic, there is a big difference between the two and often this difference can effect your bottom line. Enough With the Suspense! Is SEO Dead? This depends on your definition of SEO or more importantly the tactics used to carry it out. It wasn’t too long ago that obtaining top rankings was just a matter of analyzing on page keyword densities, buying back links and even stuffing pages with keywords. If your definition of SEO includes these tactics, than yes, SEO is clearly dead. We’ve personally never subscribed to that definition of SEO, so in truth for us SEO is still very much alive and will be for years to come. Our definition of SEO is based on short and long-term techniques. You might even say we take a more Google-Friendly approach. A successful SEO strategy consists of many things that can be summed up in a few of words. Analysis, Structure, Content, Engagement, Citations, Social Media and Back Links. Successful strategies don’t employ black-hat tactics that are meant to fool search engines but instead focus on what really matters … your customers. Engaging your audience is at the core of a well executed strategy. 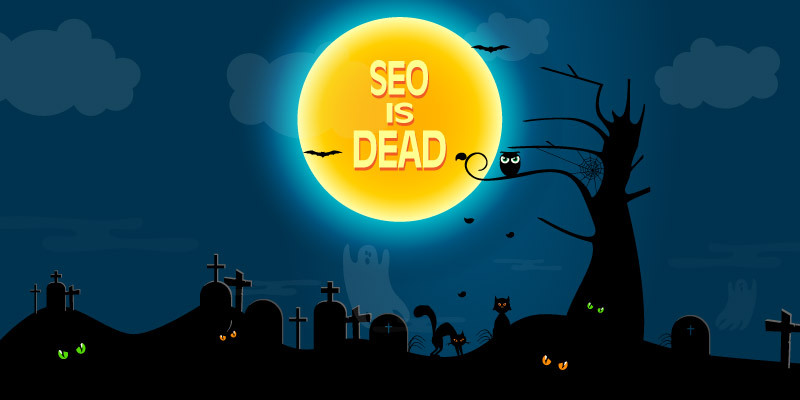 So in short the answer to the question is no, SEO is not dead! A properly analyzed, planned and executed campaign will elevate your company’s presence and bottom line. Absolutely nothing. Your website and business will be left to fend off competitors based on the merits of your company, products and services alone. In a perfect world that’s all that’s needed but in the real world SEO is a necessary tool to establish your business web presence and to generate targeted traffic. SEO can also help you to develop long-term relationships with you customers by incorporating a good measure of social media into SEO campaigns. Are you in need of internet marketing team to add fuel to your website? If so, contact us with your Internet Marketing and SEO needs. We can develop a results-driven campaign that’s right for you.